128 days prior to Asian Games XVIII of 2018, Minister of Youth and Sports Imam Nahrawi campaigned “Let’s Do Sports” Movement. The Minister held a cycling event around Gelora Bung Karno Main Stadium complex to launch the movement at Senayan, Jakarta, on Wednesday (11/4). 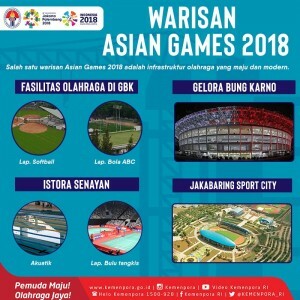 The event was attended by officials of Ministry of Youth and Sports and intended to encourage more Indonesians to exercise as well as to boost the spirit of the 2018 Asian Games. “This year marks the year of sports. Indonesia is going to host the biggest sports event after the Olympics. This morning, the spirit towards the 2018 Asian Games will start here,” said Minister Imam when starting the event. According to him, there are two important things that can be a legacy for Indonesia from this year’s Asian Games:1. Advanced and world-class sports infrastructure; 2. People who love to exercise. “There are many sports venues that have been renovated in Jakarta, Palembang, West Java and surrounding areas, which soon to be fully finished. Our task now is to make this event successful in terms of organization, achievement, administration and economic impact to the community, “said the Minister. Related to Indonesia’s achievement, Minister Imam explained that the Government is committed to fully prepareall athletes joining the competition. The preparation includes training center, nutrition for athletes, equipments, as well as prize money if the athlete gets a medal. “Since the beginning of this year, I have visited several training centers to find out obstacles during the training and to give moral support to the athletes. As host country, Indonesia has a big capital in form of full support from the community, “Minister Imam continued. He further said that currently 40 sports branches train in various national training centers and other branches undergo trials in Indonesia and abroad. The only support people can give to the athletes is to boost their spirit of exercise. Minister Imam reminded that the Asian Games is not just a sports competition, but it is also an arena to show honor and dignity of a nation. For the record, in Asian Games 1962, Indonesia did not only succeed in organizing the event but also successfully got 2nd rank. “The spirit of “Let’s Do Sport” Movement for public is to change a paradigm that exercise is only for elite athletes. The whole community reserves the right to do sports. Participation in sport is the basis of sports achievements,” Minister Imam emphasized. Cycling (gowes) from Sabang-Merauke that passes through 34 provinces and 70 districts across Indonesia, which will start in Jakarta and will end in Bali. Football competition among students divided by age:Age 12, Age 14, Age 16 and college students from 372 regencies/cities throughout Indonesia. To promote sports from village level competitions, for 6 sports branches: Volleyball, Sepak Takraw, Badminton, Table Tennis, Football and Athletics. A program that invites public to play and exercise using national standard soccer balls. A movement to promote an traditional dance from Sangir Talaud, North Sulawesi, as a pre-activity of the 2018 Asian Games in Jakarta, Palembang, and Manado. This program will break Guinness Book World Records on 5 August 2018 and people will dance all the way from Gelora Bung Karno Stadium to the Presidential Palace (around 10 km).